AEC was contracted to remove 4 x 30,000 gallon tanks & install engineer approved bracing for 2 transformer pads located next to the excavation site. During removal AEC excavated & disposed of approximately 3,500 tons of petroleum contaminated soil then back filled approximately 5,000 tons of soil. A concrete slab with reinforcement was laid to accommodate 2 x 20,000 gallon above ground tanks with a fuel polishing system. AEC designed all double wall piping & the monitoring system, hooking the new tanks to the existing boiler piping. A pump set was furnished to supply fuel to the boilers. 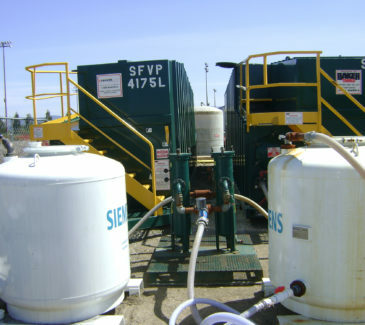 During this installation AEC pumped & treated approximately 140,000 gallons of petroleum impacted water & land applied. Subsurface investigation & installation of approximately 9 monitoring wells were installed as per the DEQ requirements. This was a competitively bid project & AEC performed 100% of this work with their own forces. Works were completed on time & within budget.